An external fixator or external fixation system is used in the treatment of bone fracture and mending, aligning the ruptured or broken bone well, increasing the healing process. Metal implants like bone clamp, fixator, wires, screws, etc are inserted into the bones This results in fracture stability which then sees to it that the bone gets back to proper shape bonding and developing again as the person recovers. The external fixation system comprises of many different types. Dynamic Axial Fixation, Tubular fixator System, the Ilizarov Ring Fixator System, etc all these are different types of external fixators. The Dynamic Axial fixation system again has many sub types. The axial fixation comes in small, medium and large sizes. There is a Compression and Lengthening System which too comes in small, medium and large sizes. For the surgery of limbs there is Limb Reconstruction System which has many different types and sizes, there are also tools known as the Radius and Distal Radius System. These are the various dynamic axial fixation instruments used in a surgery. Another type of an external fixator is the Tubular Fixator System that has a Universal Tubular fixator System for Big Bone, a Mini Tubular fixator System, Carbon Rods / S.S. Rods, Clamps and Tubes, Schanz Screw and pins. These various fixation instruments come under the tubular system of external fixators. These are the various surgical and fixation instruments used in an orthopedic surgery. The external fixation system treat the wound or damage well and fasten the healing and recovery process far safer and quicker today. Orthopedic- Implants.Netis a branded manufacturer and supplier ensure no dearth of these products and the quality is again top class since they being used for surgical purposes cannot be messed with. The D4 Surgicals India Pvt. 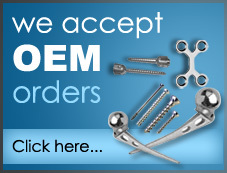 Ltd. division from India apart from a leading manufacturer is also exporter of orthopedic and surgical equipments. We offer external fixation system and fixation instruments like dynamic axial external fixator, tubular fixation system, ilizarov ring fixator, etc. We are manufacturer, supplier and exporter of such external fixation devices from India to world wide.